It's been a while, hasn't it? What I though would be a few weeks away from the blog turned into over two months away from the blog. So much has happened in those two months - some good, some bad and some ugly. After finding myself in a place where I was actually looking into caregivers for Cam should I not be around for him, thinking I was putting on a good front so that everyone thought I was doing just "fine", and then having Aunt Becky go all "I will load you up in the minivan and drag you by the hair to the doctor if you don't go NOW" on me (I'll admit, there was a moment when I considered refusal just to see if she could pull it off), I did finally talk to my doctor about how I was feeling. I've been on an antidepressant for about a month now. I had some initial troubles with some side effects, but those seem to have mellowed out now. I had no idea how sick I was (and how long this had been going on) until I started feeling better. Although I really don't like the idea of depending on a daily dose of drugs for my mental stability, I now realize it was exactly what I've needed ... likely for years. Now the trick is getting used to my emotions not being all over the place. I had gotten so used to the high, highs and the very low, lows, that this place where I'm at now feels wrong. Some of you noticed that this blog went private for a bit. Although I've had experiences with people reading my blog (and leaving comments) that I often wished would go away (notice I'm not using the "T" word?) I had my first experience with a true internet stalker. I have mentioned again and again that I hide in plain sight out here (and on twitter and tumblr). I knew that carried a risk of being "found," but the benefit of being me far outweighed that risk. What I didn't expect was a vindictive streak from someone I've known for quite some time - someone who I've had disagreements and words with in the past, but someone who I didn't imagine thought much about that past. I was wrong. On July 6th, this person decided to send an email to my employer (through my employer's CONTACT US website page) that said, "This is what your employee has been doing while at work" with a link to my tumblr. The intent was clearly to cause me emotional and financial harm (thus crossing that line to stalker). I was, not surprisingly, called into my boss's office. This photo was clearly taken at work (using my personal phone - not company resources). When asked to explain, I shrugged my shoulders and said, "It's a personal blog. I do not mention you (my employer) by name. I post to it using my phone, not your resources." I was asked to not used my phone to post to the blog during work hours unless I was "off the clock" and my tumblr was blocked. My employer did spend quite some time going through my tumblr and definitely got an eye full (and possibly an eye poked out). I have no doubt they were more embarrassed than I was. This is me, and there was some relief in learning that they now know this is me. 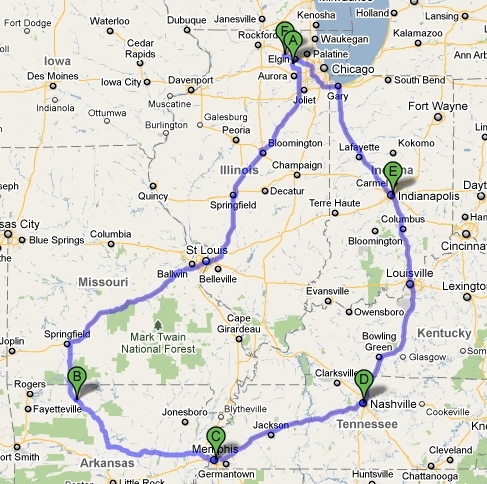 Last thing on the agenda for this not-so-brief update, I'm taking a ROAD TRIP a week from today. Cam will be at camp for the week, I have rented a car and will be meeting the internet along the way. The bulk of my time (3 days) will be spent in Nashville where ... well? We'll see if there is a story or two to tell when I get back. This is the (fairly) firm route. I desperately need this break - some time alone to ponder life and the direction I want it to head. Getting my life back is finally becoming a priority again.